A 3D pen is a bulkier version of an ordinary pen or pencil which operates using ABS or PLA plastic that melts and allows the user to redistribute the material in any way he/she desires. The PLA plastic filaments are made from starch and are environmental friendly. These PLA filaments come in a variety of colours, are glossier and gummier and thus stick to things more efficiently. On the other hand, the ABS filament is stronger, flexible and offers high temperature resistance. A 3D pen is a perfect example of the futuristic innovation which is eco-friendly and operates very quickly. The 3D pen initially gained its recognition through the emergence of the “3Doodler”. The 3Doodler is a 3D pen developed by Maxwell Bogue, Peter Dilworth and Daniel Cowen of WobbleWorks, Inc. The 3Doodler inventors built the first 3Doodler prototype in early 2012 at the Artisans’ Asylum in Somerville, Massachusetts. On February 19, 2013 WobbleWorks launched a kickstarter campaign for the 3Doodler with an initial fund raising target of $30000. This campaign was closed on 25 March, 2013. Later in January 2015, a better version of the 3Doodler was introduced known as the “3Doodler 2.0”. A 3D pen has to be plugged in firstly so that it heats/warms up. The 3D pen has a powered electric heater containing an extruder and a heating element which melts the ABS or PLA plastic filaments. These ABS or PLA plastic filaments are inserted in one end of the pen. The 3D pen works by extruding the heated plastic through its extruder tip as soon as the plastic filaments melt. The metal tip of a 3D pen can get as hot as 270 degrees centigrade. In order to avoid the pen from overheating, a 3D pen has an in-built fan. It also has arrows which acts like speed regulators. The heated plastic instantly cools into a solid, stable structure, allowing free hand drawing of 3D structures. The 3D pen has a main button present on it through which the user can control the flow of the plastic filaments. In order to make the filaments flow, the user is required to press the main button and for stopping the flow he/she is required to release and let go off the main button. The plastic filaments are loaded in the back of the 3D pen. Now, for the efficient use of a 3D pen the user is required to load small quantity of the plastic so that the pen can be operated at an angle of 45 degrees. For changing the colour, the user is required to repeatedly add a new colour. 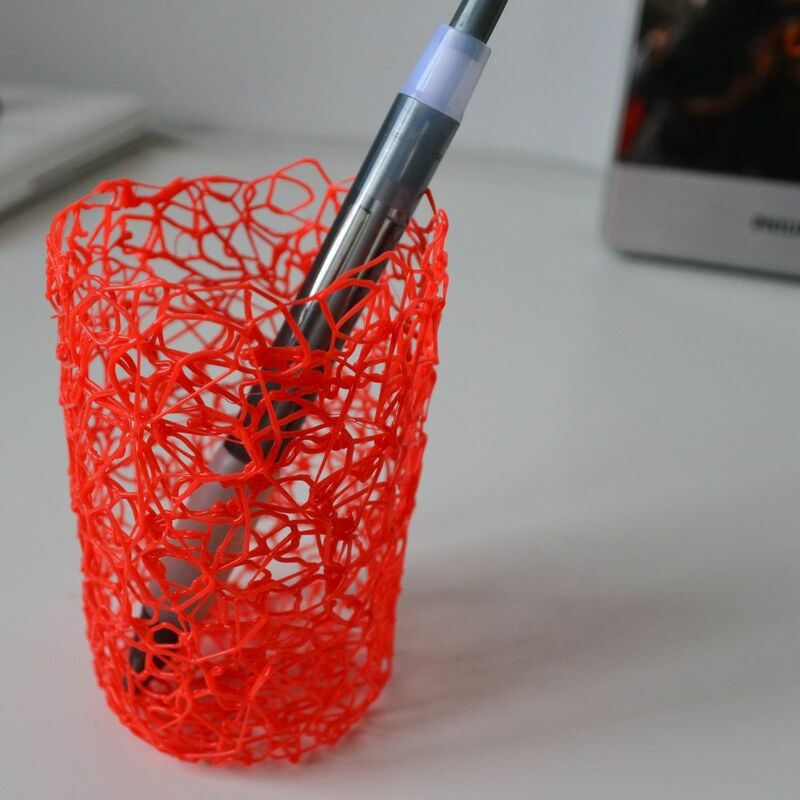 The speed setting of a 3D pen allows the user to control and maintain the flow of plastic. Through the speed setting a user can easily work on the delicacy of the fine details of his/her work. A 3D pen generally offers two speed settings which are slow and fast. With the help of the lower or upper doodle buttons present on the pen’s body a user can switch between the different speeds. Personalisation and customization of objects like pens, mobiles, laptops, etc. They can be used in multiple ways by the users depending upon the user's level of creativity and imagination. The 3D pen is not a toy as the tip from which the plastic comes out can reach a temperature of 518 degree fahrenheit. The optimum usage of 3D pens is limited to a certain group of people.The usage of a 3D pen involves free hand drawing in mid air and only a person with a high level of perfection and creativity can create useful and presentable structures out of it. The 3D pens have multiple uses. Other than just drawing on templates and in air, 3D pens can be used for creating ornaments, pendants and jewellery. Sculptures and statues can be created with precision with the help of 3D pens. However, for optimum working of the 3D pen, a user has to use it carefully and keep it well maintained.